Airport lighting is controlled by ATC at towered airports. At nontowered airports, the lights may be on a timer, or where an FSS is located at an airport, the FSS personnel may control the lighting. A pilot may request various light systems be turned on or off and also request a specified intensity, if available, from ATC or FSS personnel. At selected nontowered airports, the pilot may control the lighting by using the radio. This is done by selecting a specified frequency and clicking the radio microphone. [Figure 14-34] For information on pilot controlled lighting at various airports, refer to the Chart Supplement U.S. (formerly Airport/Facility Directory). Figure 14-34. Radio controlled runway lighting. Similar to runway lighting, taxiways also have various lights which help pilots identify areas of the taxiway and any surrounding runways. Omnidirectional taxiway lights outline the edges of the taxiway and are blue in color. At many airports, these edge lights may have variable intensity settings that may be adjusted by an ATC when deemed necessary or when requested by the pilot. Some airports also have taxiway centerline lights that are green in color. Clearance bar lights are installed at holding positions on taxiways in order to increase the conspicuity of the holding position in low visibility conditions. They may also be installed to indicate the location of an intersecting taxiway during periods of darkness. Clearance bars consist of three in-pavement steady-burning yellow lights. Runway guard lights are installed at taxiway/runway intersections. They are primarily used to enhance the conspicuity of taxiway/runway intersections during low visibility conditions, but may be used in all weather conditions. 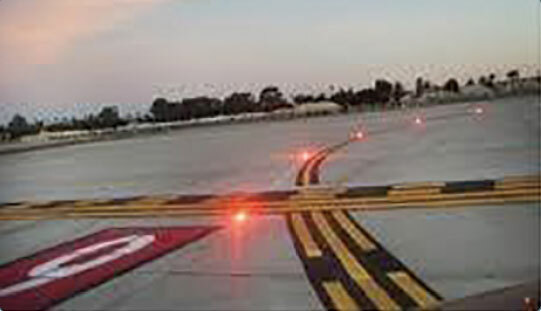 Runway guard lights consist of either a pair of elevated flashing yellow lights installed on either side of the taxiway, or a row of in-pavement yellow lights installed across the entire taxiway, at the runway holding position marking. Note: Some airports may have a row of three or five in-pavement yellow lights installed at taxiway/runway intersections. They should not be confused with clearance bar lights described previously in this section. Stop bar lights, when installed, are used to confirm the ATC clearance to enter or cross the active runway in low visibility conditions (below 1,200 ft Runway Visual Range (RVR)). 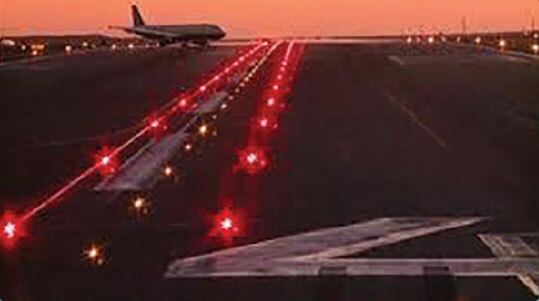 A stop bar consists of a row of red, unidirectional, steadyburning in-pavement lights installed across the entire taxiway at the runway holding position, and elevated steady-burning red lights on each side. A controlled stop bar is operated in conjunction with the taxiway centerline lead-on lights which extend from the stop bar toward the runway. Following the ATC clearance to proceed, the stop bar is turned off and the lead-on lights are turned on. The stop bar and lead-on lights are automatically reset by a sensor or backup timer. Obstructions are marked or lighted to warn pilots of their presence during daytime and nighttime conditions. Obstruction lighting can be found both on and off an airport to identify obstructions. They may be marked or lighted in any of the following conditions. Red obstruction lights—flash or emit a steady red color during nighttime operations, and the obstructions are painted orange and white for daytime operations. High intensity white obstruction lights—flash high intensity white lights during the daytime with the intensity reduced for nighttime. Dual lighting—a combination of flashing red beacons and steady red lights for nighttime operation and high intensity white lights for daytime operations. A top priority of the FAA is to continue to enhance airport safety while maintaining airport capacity. Reducing runway incursions is a major component of this effort. Runway incursions develop quickly and without warning during routine traffic situations on the airport surface, leaving little time for corrective action. The Runway Status Lights (RWSL) System is designed to provide a direct indication to you that it is unsafe to enter a runway, cross a runway, or takeoff from or land on a runway when the system is activated. Figure 14-35. Runway Entrance Lights (REL). Figure 14-36. Takeoff Hold Lights (THL). REL provide a warning to aircraft crossing or entering a runway from intersecting taxiways that there is conflicting traffic on the runway. THL provide a warning signal to aircraft in position for takeoff that the runway is occupied and it is unsafe to take off. As of 2016, the RWSL system is operational at 14 of the nation’s busiest airports with 3 more airports scheduled to receive the system by 2017.